Like many cigar smokers on a budget, I tend to find the best deals online. I would really prefer to patronize my local cigar shop, especially in an economy as devastated as this one, but it simply isn’t practical to spend $150 at the B&M for a box that I can easily find for half that online. As a budget-minded consumer I am simply driven to the cigar auctions like so many other lemmings trying to snag a deal. So I assuage my guilt for succumbing to market forces by visiting my B&M and buying cigars I know I can’t get online. Some cigar manufacturers have gone so far as to distribute certain blends exclusively through local cigar shops, which accomplishes two things: it helps out the the small businesses who have to struggle with a bad economy and an onerous tax system, and it helps to promote and maintain the culture of cigar smoking, something a small cigar shop with a lounge does much better than an online monolith. So whenever I hit the B&M I take a look at this line. I reviewed the Por Larrañaga entry last summer, and these Montecristo toros have been waiting patiently in line since then. Their time has arrived. 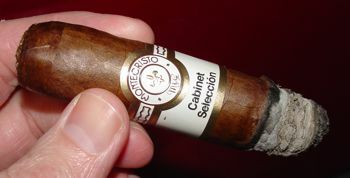 The Montecristo Cabinet Selección features an Ecuadorian Sumatra wrapper leaf, a Connecticut broadleaf binder, and filler from the Dominican Republic, Nicaragua, and Peru. The appearance of just about any cigar would be improved by the addition of a Montecristo band, but the Montecristo Cabinet Selección Toro is, even without the band, a nice looking stick. The wrapper is even and smooth, if a bit dry looking, and the roll is rock solid. The head of the cigar is not formed very well and the cap is not applied with great attention (which seems typical for Altadis), but once cut the cigar reveals a draw that is exactly where it should be. The burn is even and the ash is firm. This Monte Cab is for most part a dry smoke. It opens with pepper and tannin, a dry spicy combination that reminds me more of a Nicaraguan style cigar than any Montecristo. The cigar’s best features are apparent in the aroma, which from the start is cedary with a touch of cocoa. The middle section drops the tannin down a notch and picks up an earthier cast. It’s still fairly spicy on the tongue, but somewhat bitter as well. The last third is earthy and remains tannic. The aroma has an interesting butterscotch-like scent which is a nice counterpart to the the tannins, but the bitterness overwhelms what little sweetness there is. The last inch is charred in flavor and a little too sharp on the tongue. The Montecristo Cabinet Selección retails for around 6 USD, a quite reasonable asking price if this flavor profile tickles your fancy. Unfortunately I found the tannins to be too heavy, pushing the blend slightly off balance, and the peppery edge was a bit harsh. On the other hand, I loved the wrapper leaf and the aroma of the cigar. And it is a well constructed stick, as one would expect from any cigar bearing the august title Montecristo, so I can see how many people would think highly of the blend. But in the final analysis, it’s not for me.